Remodeling your home is a major undertaking and costs can quickly get out of control if not closely monitored. 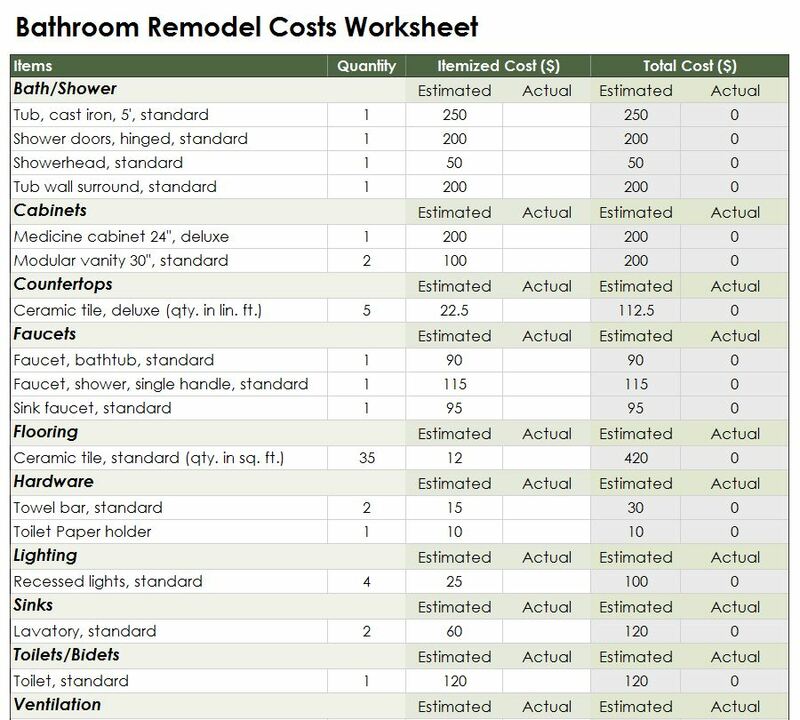 The Microsoft bathroom remodel cost calculator is an easy way see the whole project at a glance. You can download and use the free Excel template and adapt it to your own project with a few keystrokes. It is a simple yet dynamic tool providing an ongoing overview of actual costs versus projected costs for every component of your remodeling project. The bathroom remodel cost calculator helps keep the project organized and avoids unexpected surprises because something got overlooked. Download it before your next bathroom remodeling project and see exactly where the money is being spent. The first thing you need to do is download the free bathroom remodel cost calculator. Gather a list of all the fittings, hardware and cabinet you are buying. Open Excel and select new template in the drop-down menu. Click on the free bathroom remodeling cost calculator to open it. Enter the estimated costs for each component of the remodel. You can also enter the actual costs of materials, fittings and hardware already purchased. The other actual costs should be listed as the materials are purchased so that your project overview remains current. After adding the figures, save the file to a location on your computer for easy reference later on. Try to get a firm estimate on labor costs to list in the calculator. After everything is listed, add another item representing unexpected expenses. A good rule of thumb is to add thirty percent to your total expected costs for this. If you haven’t purchased everything yet look up the prices for the items you want to get a good estimate of your costs. It is a good idea to use the calculator even at the early planning stage so that you can estimate project costs and make changes to keep within your budget. The template is easy to customize by adding new cells, rows or columns. Download the bathroom remodel cost calculator today to keep control of your project costs.